Hawker’s Delight is known for their Malaysian-Singaporean cuisine and I finally had a chance to try it! They’re a bit of a hole in the wall and the inside is kinda dark and small too. You order at the counter and then they’ll give you a number and call you when it’s ready. Our food came INCREDIBLY fast. I guess because everything is pretty much prepared already and they just need to assemble it in a bowl. We both ordered the Laksa for $7.15!!! It was a HUGE piping hot bowl and the noodles were filled all the way to the top. Not sure if you can tell how big it is from this picture! The toppings include a hard boiled egg, tofu puffs, chicken and sliced fish cubes. The chicken was sliced into thin strips and was tender and smooth. There was also some sauce on top but I wasn’t sure what it was but it was tasty mixed in with everything. There were also some bean sprouts at the bottom that I discovered later. The soup was very creamy but not as spicy as I imagined. The heat was more like an afterthought. Needless to say, neither of us finished our bowls and we ended up taking half to go. The take out containers cost $0.25 each but it was still a good deal considering this was two meals for me. We should really learn to share. Also, our lunch took less than half an hour! Not everything is this cheap but the portion makes up for it. 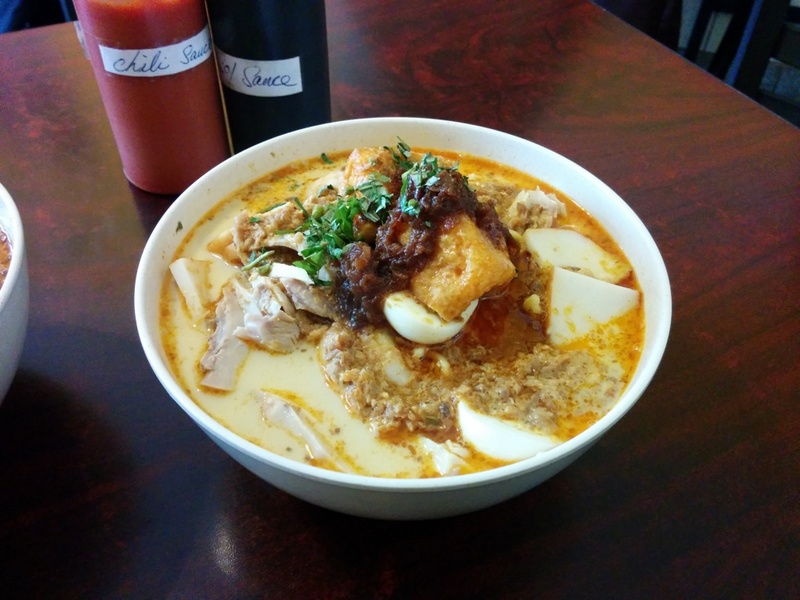 This entry was posted in Food Reviews, Malaysian and tagged cheap, laksa.